Why Join the Hitler Youth? The question of Joseph Ratzinger’s involvement with Nazi Germany and the Hitler Youth is important in consideration of the life of the man who became Pope Benedict XVI. While it led some to question his character, he nevertheless passed an investigation by the Wiesenthal Center, clearing him of any accusation of antisemitism. During much of the Nazi era, Joseph Ratzinger lived with his family in Traunstein, Germany, a small and staunchly Catholic town between Munich and Salzburg. During World War I there was a prisoner-of-war camp located here where, ironically, Adolf Hitler worked between December 1918 and March 1919. The town is located near the region of Austria which Hitler came from. A few hundred yards away from the Ratzingers' house, a family hid Hans Braxenthaler, a local resistance fighter who shot himself rather than be captured again. The SS regularly searched local homes for resistance members, so the Ratzingers couldn’t have been ignorant about resistance efforts. It’s curious that one of the lessons which Joseph Ratzinger, who became Pope Benedict XVI, draws from the experiences of German Catholics under the Nazis is that Catholics should become even more obedient to their ecclesiastical leaders rather than more free to adopt independent courses of action. Ratzinger believes that greater fidelity to Catholic doctrine, as defined by the Vatican, is necessary to counter movements like Nazism. Neither Ratzinger nor any member of his immediate family joined the NSDAP (Nazi Party). Ratzinger’s father was critical of the Nazi government, and as a result, the family had to move four times before he was ten years old. None of this is remarkable, however, because the same happened with other German Catholic families. Although many German Catholic leaders were willing to work with the Nazis, many individual Catholics and Catholic priests resisted as best they could, refusing to cooperate with a political regime they regarded as anti-Catholic at best and the embodiment of evil at worst. Joseph Ratzinger joined the Hitler Youth in 1941 when, according to him and his supporters, it became compulsory for all German boys. Millions of Germans were in a position similar to that of Joseph Ratzinger and his family, so why spend so much time focusing on him? Because he didn't remain merely Joseph Ratzinger or even a Catholic Cardinal — he became Pope Benedict XVI. None of the other Germans who joined the Hitler Youth were part of the military in Nazi Germany, lived near a concentration camp, and watched Jews being rounded up for death camps has ever become pope. The pope is supposed to be the successor of Peter, leader of the Christian Church, and symbol of unity for all Christendom. The past actions — or inactions — of such a personal matter a great deal if anyone is going to treat him as any sort of moral authority. Ratzinger’s recollections of his youth in Nazi Germany makes it seem as though all the problems, violence, and hatred existed outside his local community. There is no recognition that resistance to the Nazis existed — or was needed — just outside his door. Hitler Jugend: Joseph Ratzinger has explained that his membership in the Hitler Youth was mandatory — it wasn’t his personal choice to join and he certainly didn’t join out of any personal conviction that the Nazis were right. Despite being a member, he refused to attend any meetings. Attendance would have reduced the cost of his schooling at the seminary, yet this did not deter him. Resistance: According to Joseph Ratzinger, it was “impossible” to resist the Nazis. Being so young, it wasn’t plausible for him to do anything against the Nazis and the atrocities they were committing. Nevertheless, the Ratzinger family did object to the Nazis and, as a consequence, were forced to move four times. It’s not as though they passively and quietly accepted what is going on, as many other families did. Military: Joseph Ratzinger was a member of an anti-aircraft unit protecting a BMW factory that used slave labor from the Dachau concentration camp to make aircraft engines, but he was drafted into the military and didn’t have any choice in the matter. In fact, Ratzinger also says that he never fired a shot and never participated in any combat. Later he was transferred to a unit in Hungary where he set up tank traps and watched as Jews were rounded up for transport to death camps. Eventually, he deserted and became a prisoner of war. Hitler Jugend: Joseph Ratzinger’s claims about the Hitler Youth are not true. Compulsory membership was first defined in 1936 and reinforced in 1939, not in 1941 as he says. Ratzinger also says that he was “still too young” at the time, but he was 14 in 1941 and not too young at all: between the ages of 10 and 14, membership in the Deutsche Jungvolk (a group for younger children) was mandatory. Yet there is no mention of Ratzinger belonging. If he had managed to avoid the required membership in the Deutsche Jungvolk, why did he suddenly join the Hitler Youth in 1941? Resistance: Both Joseph Ratzinger and his brother, Georg, have said that “resistance was impossible” at the time and, therefore, it’s not surprising or morally culpable that they also “went along.” This is also not true. First, it’s insulting to the many who risked their lives to resist the Nazi regime, both in organized cells and on an individual basis. Second, there are many examples of those who refused service in the Hitler Youth for a variety of reasons. Whatever the Ratzinger family did and whatever Joseph Ratzinger’s father did, it wasn’t enough to be arrested or sent to a concentration camp. It doesn’t even appear to have been enough to warrant being detained and questioned by the Gestapo. Military: Although it is true that Ratzinger deserted the military rather than continue fighting, he didn’t do so until April 1945, when the end of the war was quite close. There is absolutely no reason to think that Joseph Ratzinger, who became Pope Benedict XVI, is now or has ever been secretly a Nazi. Nothing he has ever said or done even remotely suggests the slightest sympathy with any of the basic Nazi ideas or goals. Any claim that he is a Nazi is implausible at best. However, that is not the end of the story. 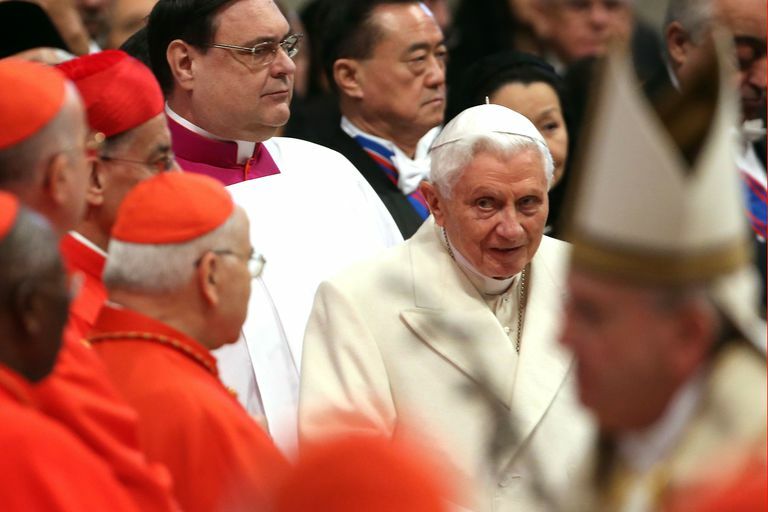 While Ratzinger was not a Nazi in the past and Benedict XVI is not a Nazi now, there is more than enough reason to question the handling of his past. It appears that he hasn’t been honest with others — and probably not honest with himself — about what he did and what he could have done. It’s simply not true that resistance was impossible at the time. Difficult, yes; dangerous, yes. But not impossible. John Paul II participated in anti-Nazi theater performances in Poland, yet there is no evidence of Joseph Ratzinger even doing this much. Ratzinger may have done more than many others to resist, but he also did far less than some. It’s certainly understandable that he wouldn’t have had the courage to do more and, were he an average person, that would be the end of the story. But he isn’t an average person, is he? He was the pope, a person who is supposed to be the successor of Peter, head of the Christian Church, and symbol of unity for all Christendom. You don’t have to be morally perfect to hold such a position, but it’s not unreasonable to expect such a person to have come to terms with their moral failings, even the moral failings that occurred in youth when we don’t usually expect a great deal. It was an understandable mistake or failing not to do more against the Nazis, but still, a failing that he hasn’t come to terms with — it sounds rather like he is in denial. In a sense, he has yet to repent; yet he was still considered the best of all the candidates for the papacy.